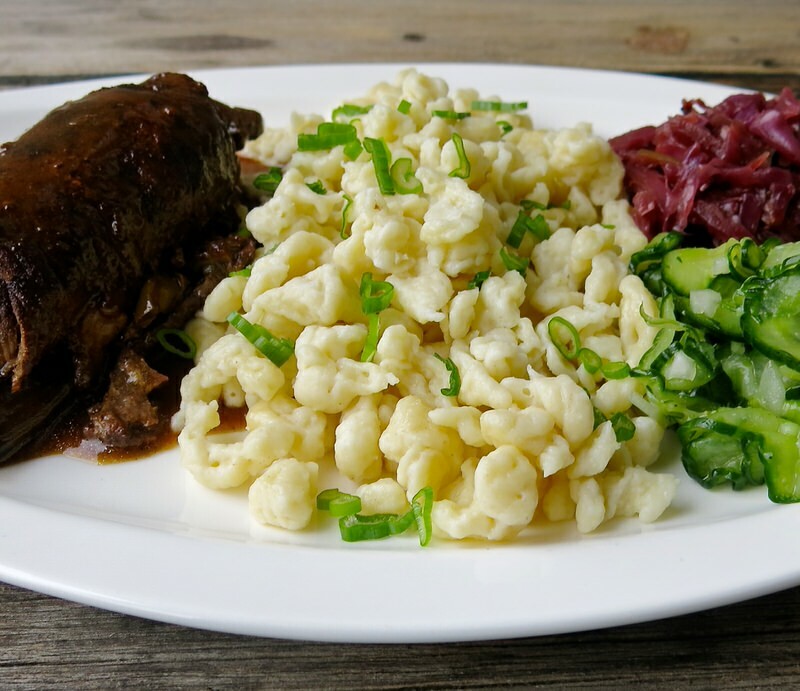 German Spaetzle or Spätzle reinvented for Vanja’s breakfast the morning after our lovely Sunday Supper of German Fleisch Rouladen. 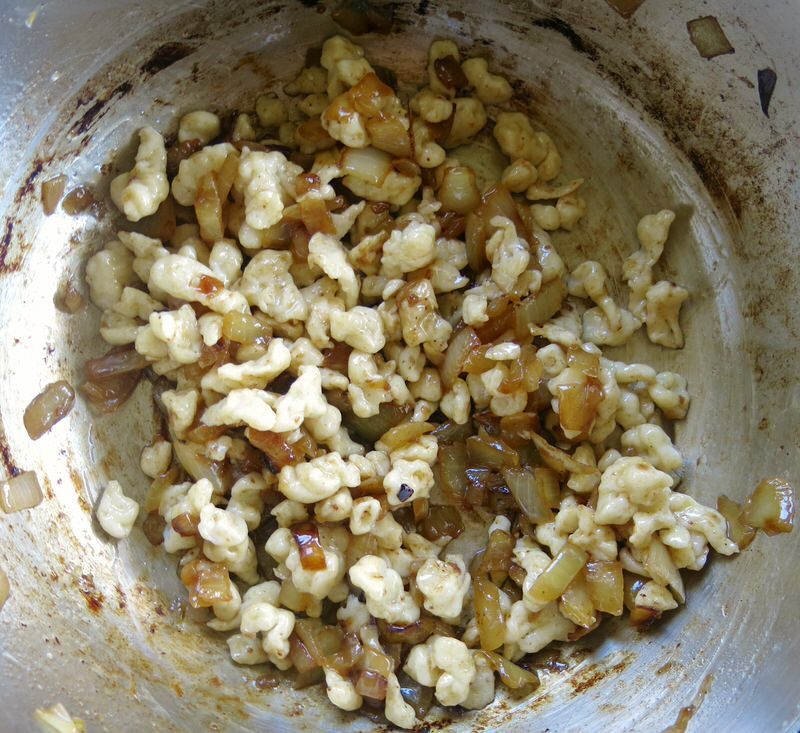 Making German Spaetzle or Spätzle was part of the Valerie Cooking in the Kitchen with Margaret Bose Johnson day. 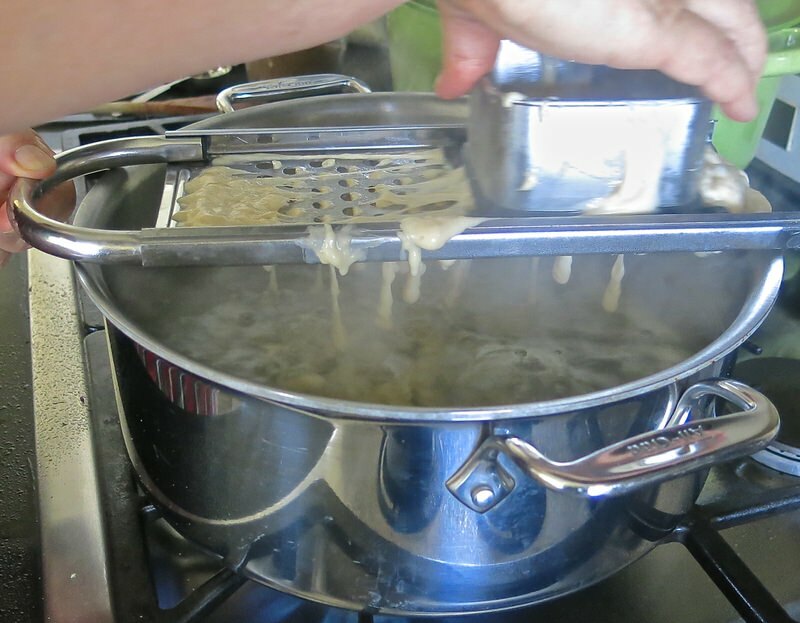 She taught me how to make the most tasty, chewy, eggy, scrumptious German noodles which I will share with you. Sunday Brunch for Vanja is often his favourite platter of bacon and eggs. 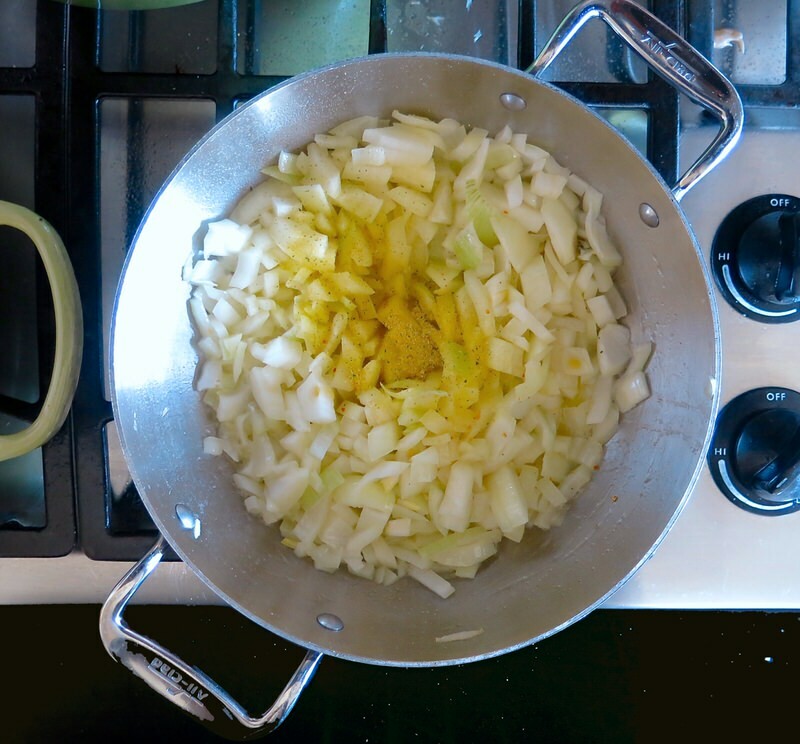 This morning, the browned butter and caramelized onion were tossed with the Spaetzle and a little fresh green onion, and oh, my. This was another plate lickin’ lip-smackin’ wonder. 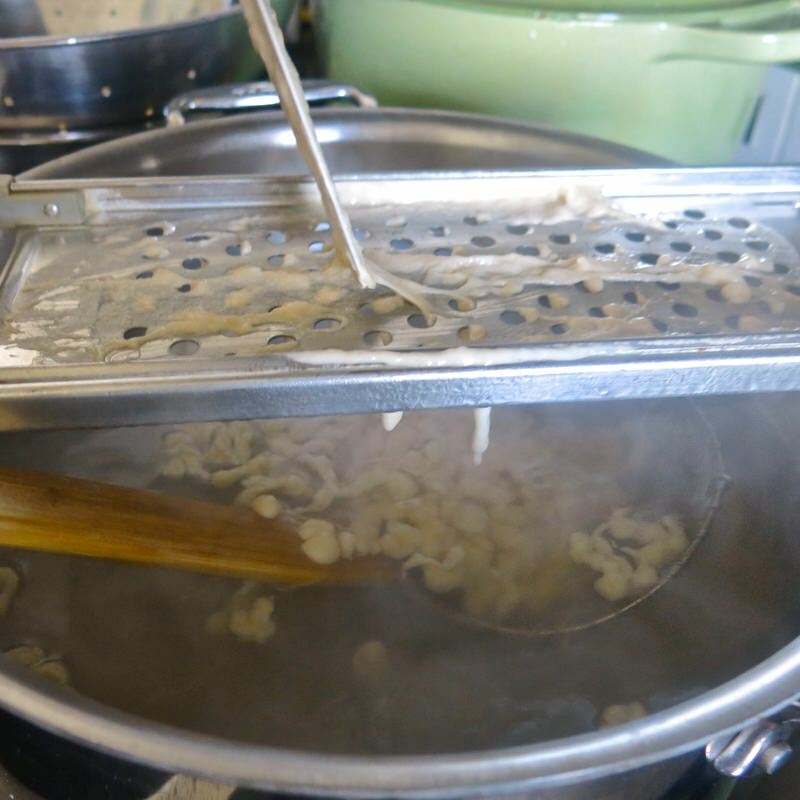 First, there are a host of tools created to make the little sparrow shaped egg noodles. Margaret’s favourite from Germany was inaccessible due to renovations, so she demonstrated various techniques to me, including the old and traditional hand cut Spaetzle. 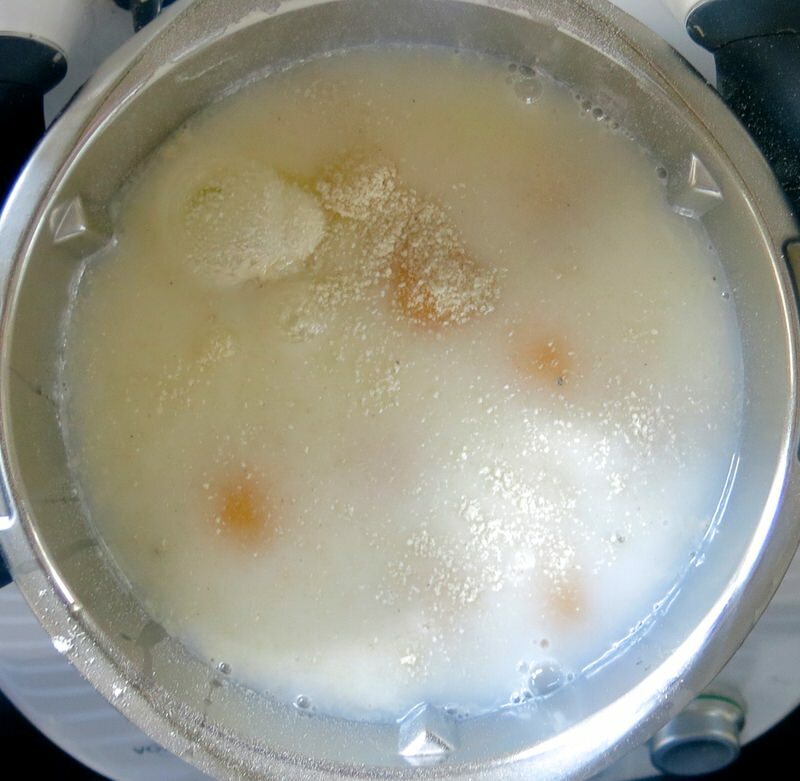 I was a little worried about making the entire recipe Margaret shared with a dozen eggs and 6 cups of flour, until she told me how fabulously it freezes: similarly to that of pyrogies or rice. Perfect. Big batch it is. 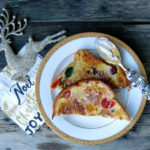 She added that there are a myriad of other ways to serve it like tossing it with cheese. Hmmm. 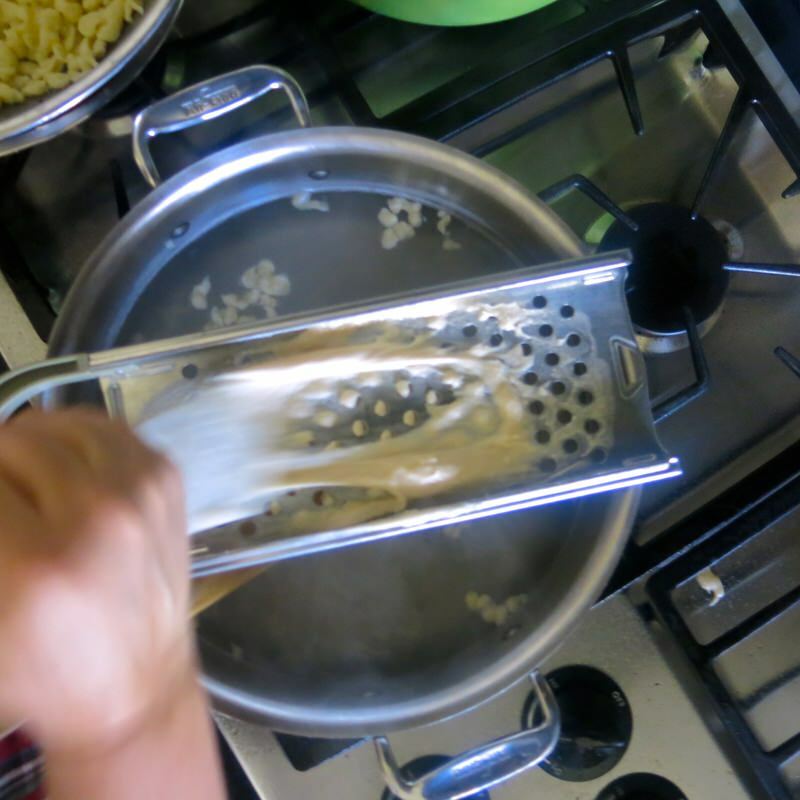 I later learned that is called Spätzle mit Käse überbacken where warm spätzle is simply mixed with cheese and topped with paprika. 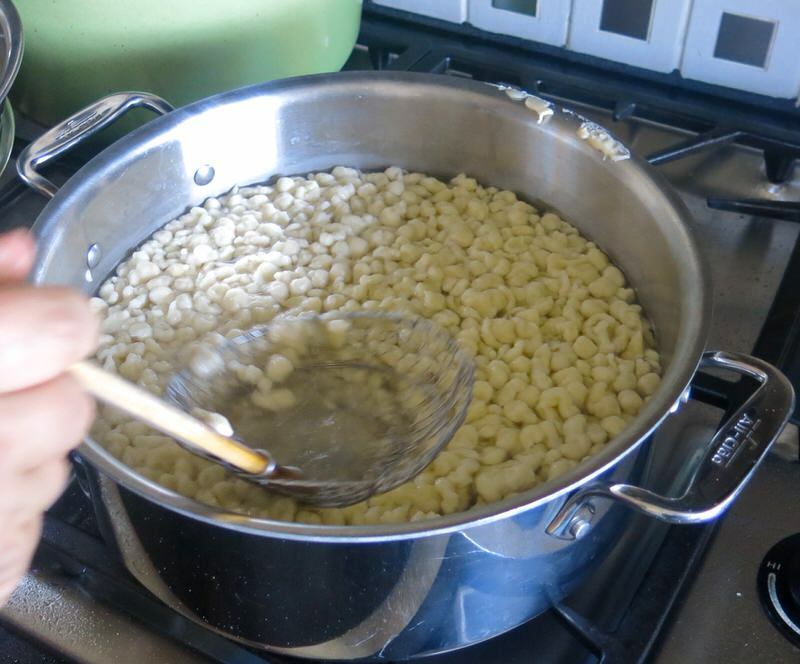 Investigating further, I could see Vanja’s mom likely knew how to make a Serbian or Eastern European version of Spaetzle as she also made knedle in special soups which is the same dough and sometimes with a little chicken liver mixed into it for soups. 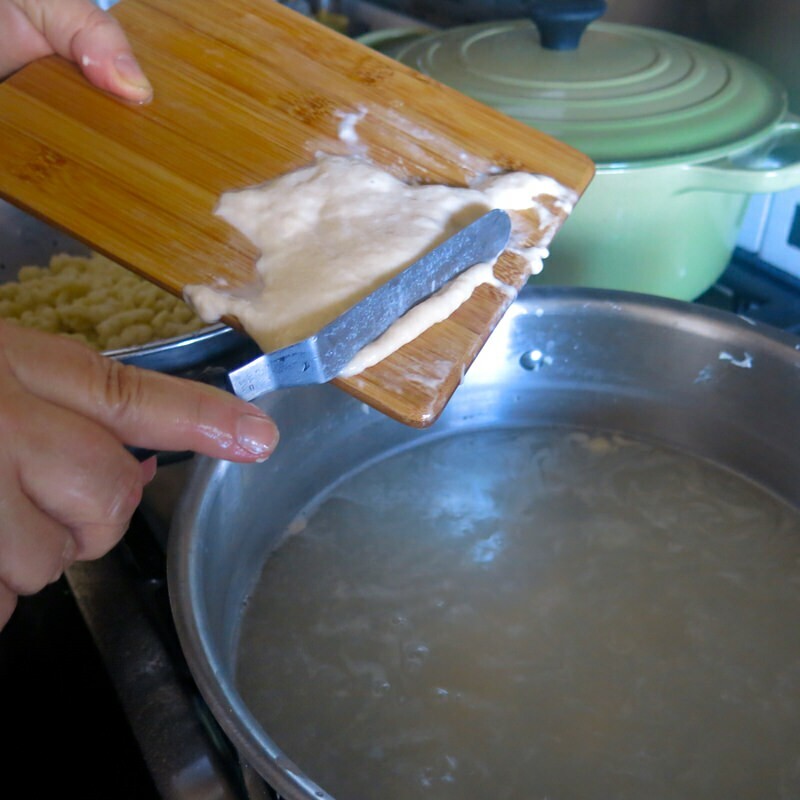 I think Pava just spooned her dough and dropped it into the soup by spoonfuls, similar to the handcut style, but with a spoon. 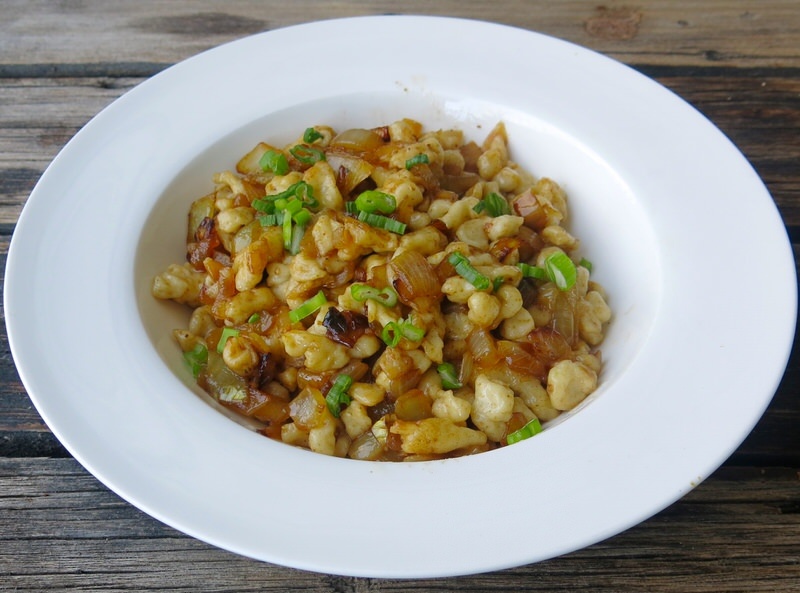 Käsespätzle is another version of spätzle mixed with grated Emmenthaler cheese and fried onion. That would definitely stick to your ribs! 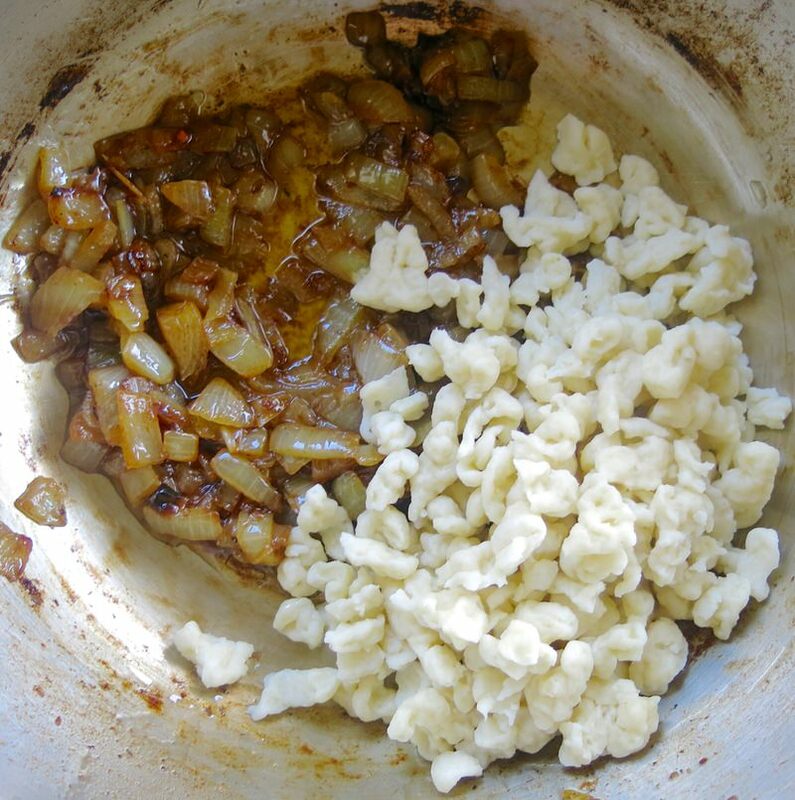 Krautspätzle is spätzle mixed with sauerkraut, onion, butter and herbs or even caraway. 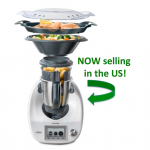 There is even a version where pureed spinach is mixed into the dough. 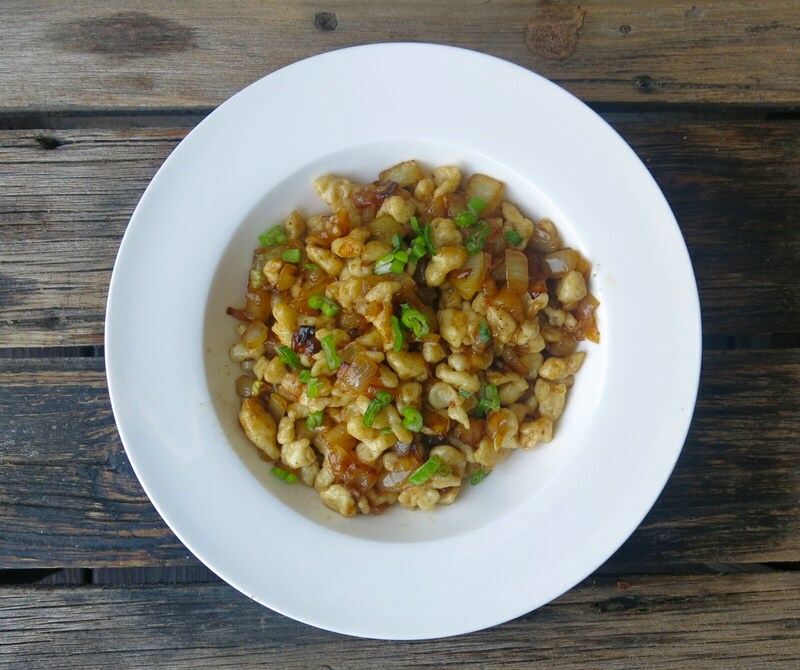 Kirschspätzle is a sweet version where the dense eggy noodles are mixed with fresh tart cherries, dressed with clarified, browned butter, sugar, cinnamon and nutmeg sometimes served as a one-dish supper in late summer during cherry season. 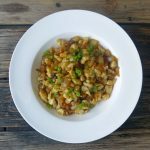 Apfelspätzle is made with grating apples into the spätzle dough, also dressed with clarified, browned butter, sugar, and cinnamon and served as a one-dish supper in apple season, late autumn. 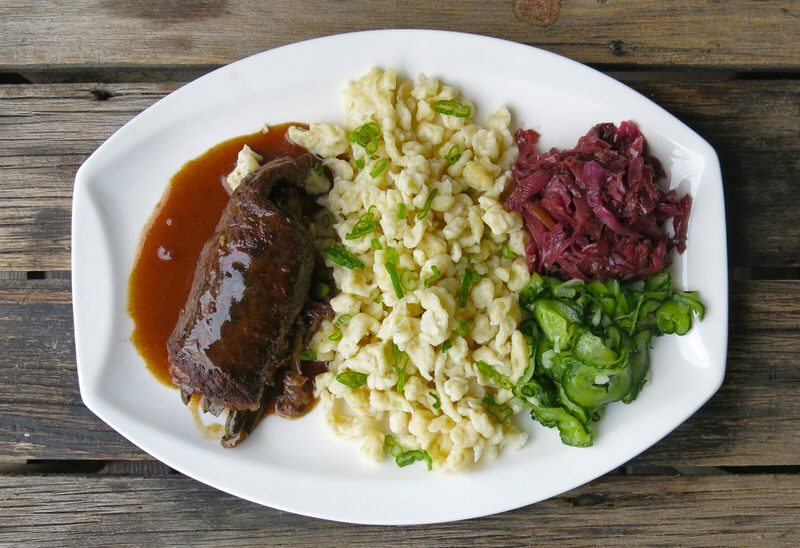 Served traditionally, as above, everyone agreed that the gravy breathed life into the Spaetzle and that the Spaetzle did the same for the gravy. 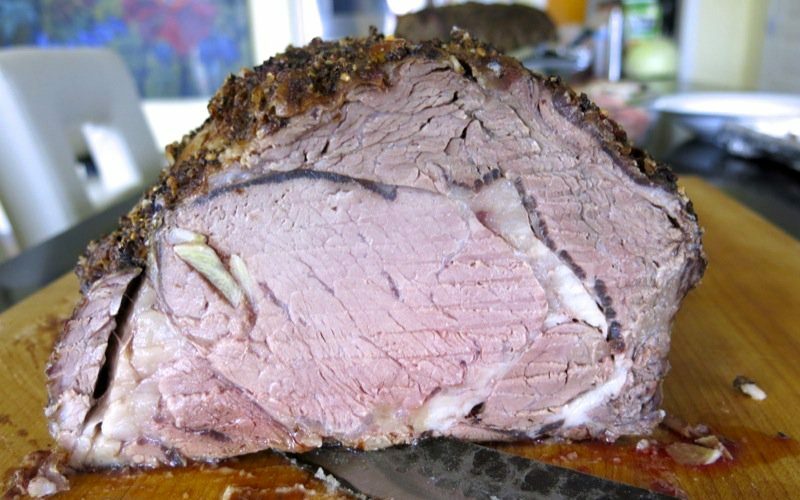 I, personally, loved it plain, with butter and salt. This is not a light tender pasta like noodle. 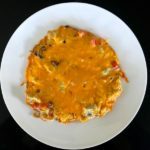 It is dense, toothsome and full of eggy flavour. Margaret’s site is Kitchen Frau and not to be missed. She participated in Project 2017: Valerie Cooking in the Kitchen with… making this entire meal with me and has been a favourite read of mine for years. 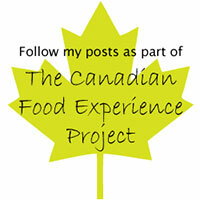 Be sure to stop by, say hi and how much you love her recipes here! Remember our project hashtag please: #ACFValerieCookingwithYOU! 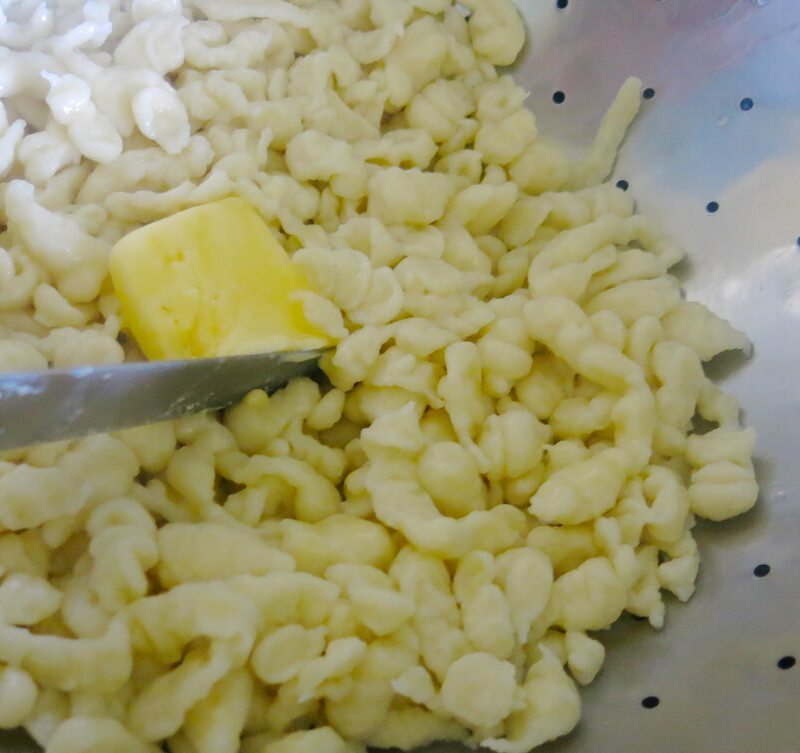 German Spaetzle or Spätzle (soft egg noodle):Mis en Place – or not! Of course I made it in my Thermomix. Instructions are in the recipe for both methods. The mis en place? Woops! 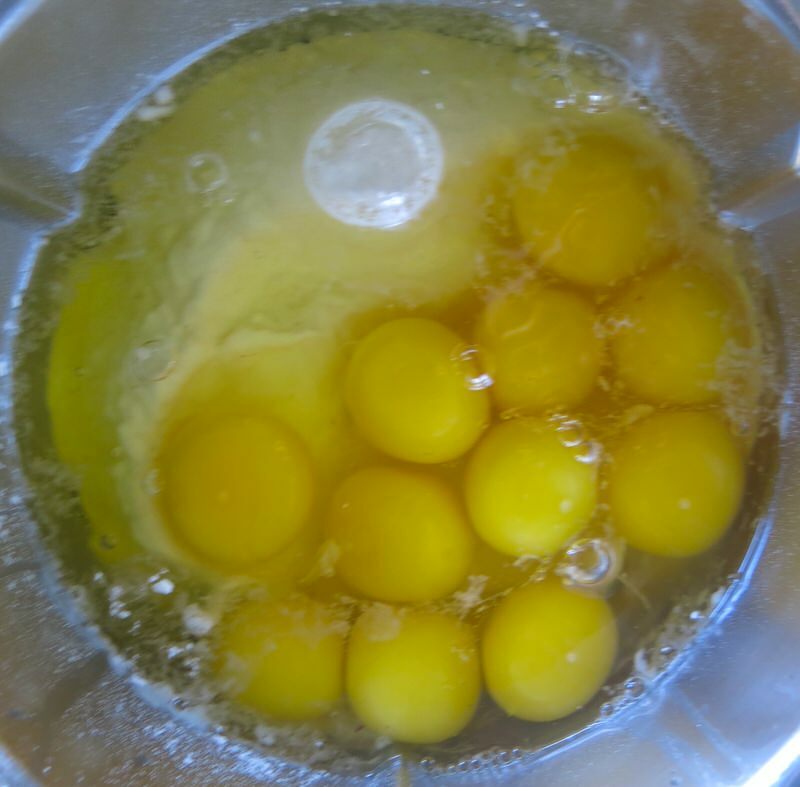 Twelve eggs, 6 cups flour, 150 grams milk, 150 grams water, and salt. Simple. 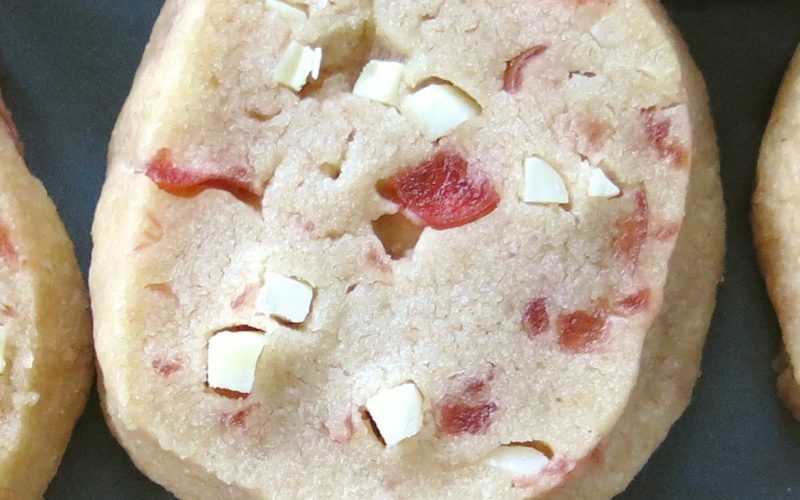 As mentioned above: ground spinach, chicken liver, herbs, paprika, even a portion of semolina and whatever the imagination can come up with can be added to the ingredients and mixed into this strong and independent German dough. This is as much a dough as it is a batter. A batter is loose. A dough is tight. Yet, a batter is shiny and a dough is matte. This is a shiny dough. You have the correct consistency when the dough holds its own when plopped onto a work surface and oozes slowly like lava. It is elastic and will stay momentarily in a blob when placed on a small board or on the maker. 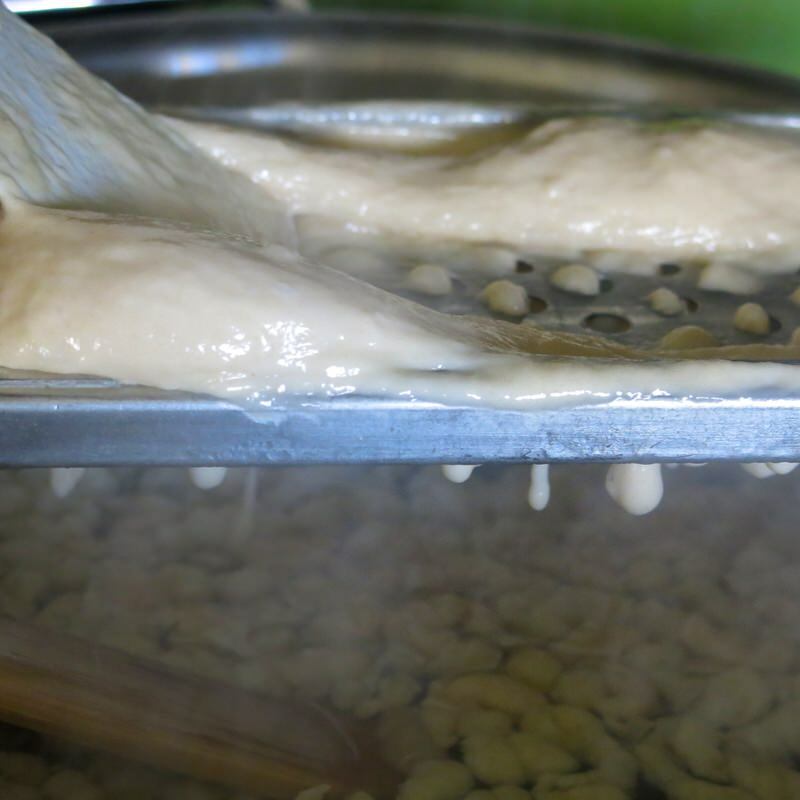 The dough is viscous and will “run” or slump slowly. 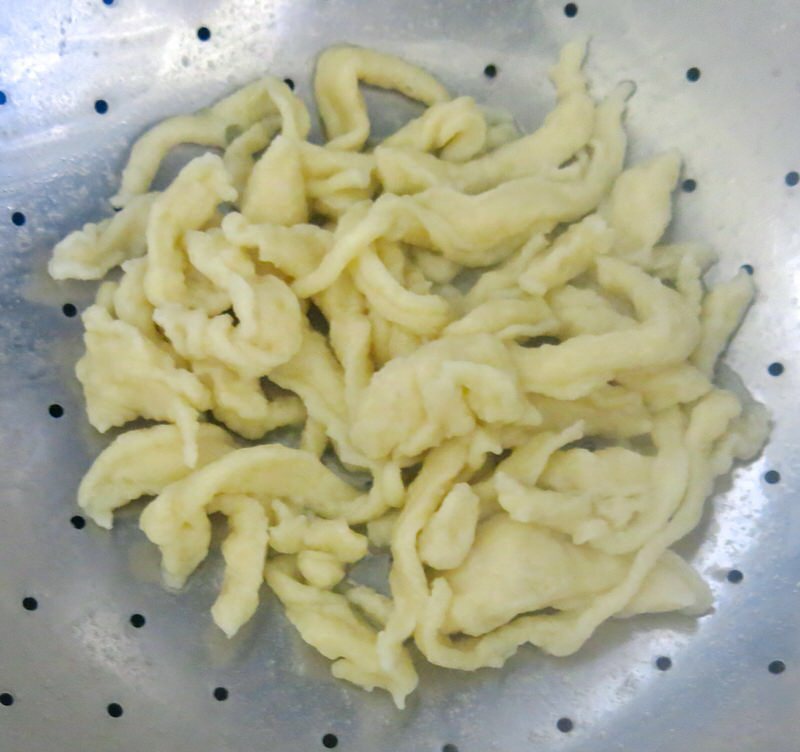 It is dough-like and batter-like when the correct consistency has been reached. It is shiny and “sheets” when pulled from the bowl with a spatula as in the above photo. You have to pinch it to separate the portions as it is so elastic and stretches so much. 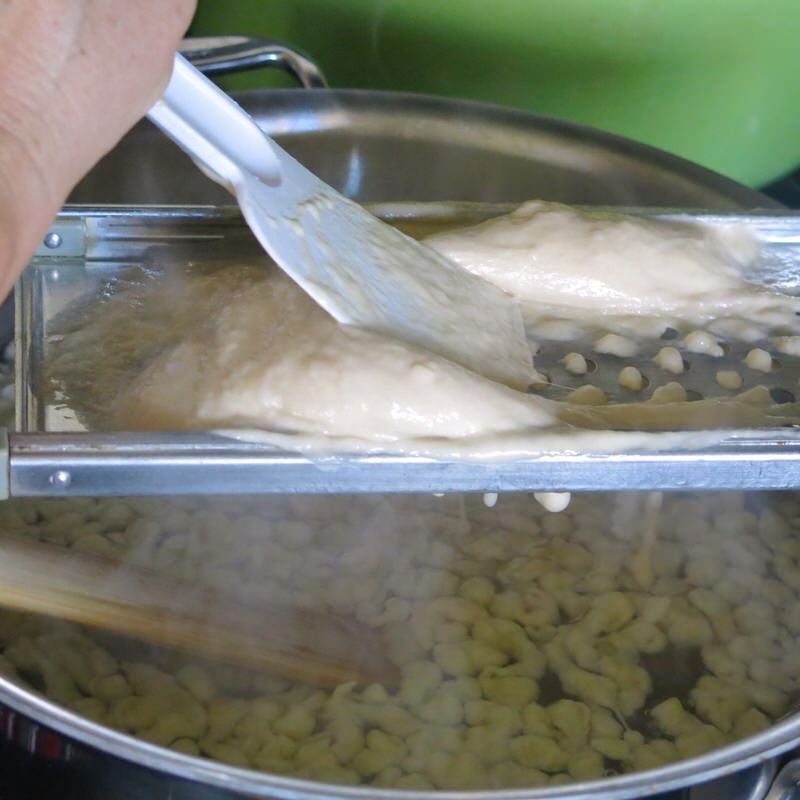 You will also see, below, during the making of the noodles, how the dough sits on the Spaetzle Maker. 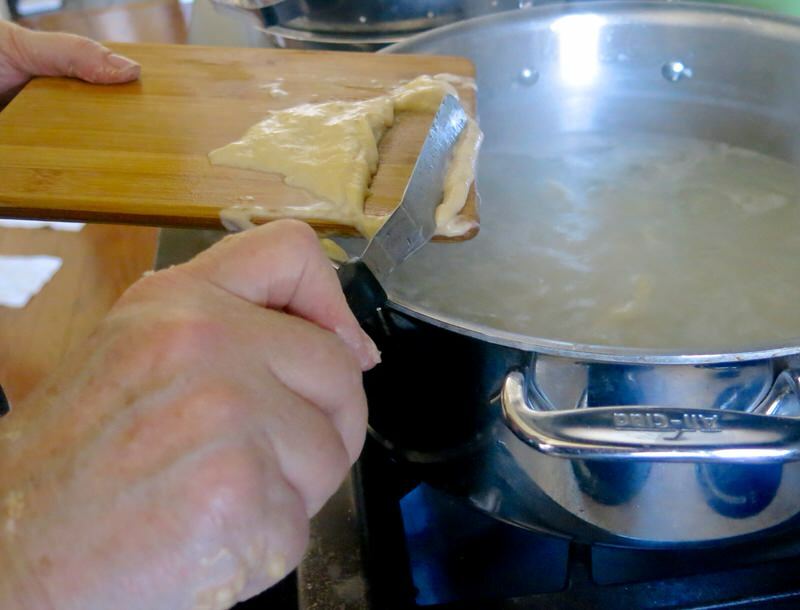 The dough can be made looser, and some do that, by adding more liquid. 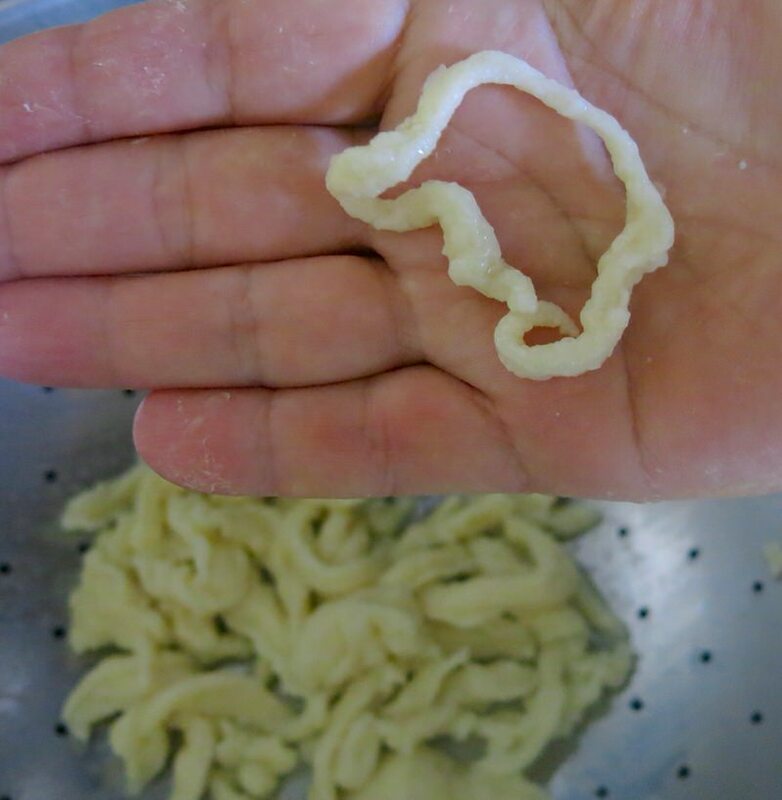 The noodle texture is then different, lighter and softer, some might say “fluffier” but this is often done due to personal preference, upbringing, or to accommodate the process due to the maker being used. 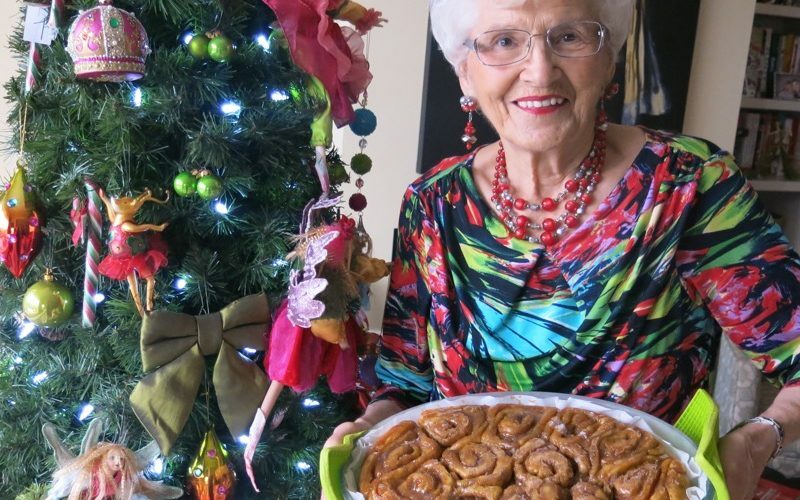 Margaret’s mom only used eggs, flour and salt. They were raised with a chewy, toothsome eggy noodle. This is what she grew to love and has taught us here. Yup. 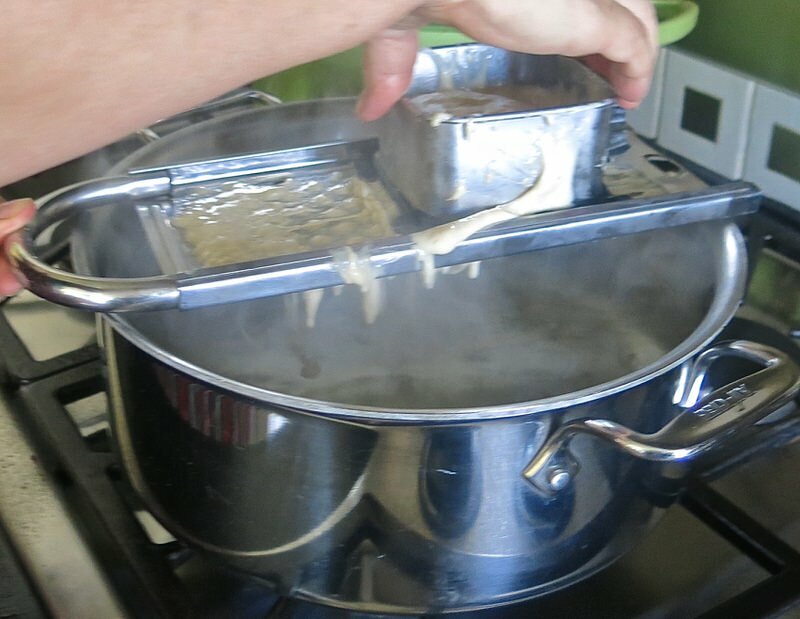 Now I remember why I only used this Spaetzle maker twice. 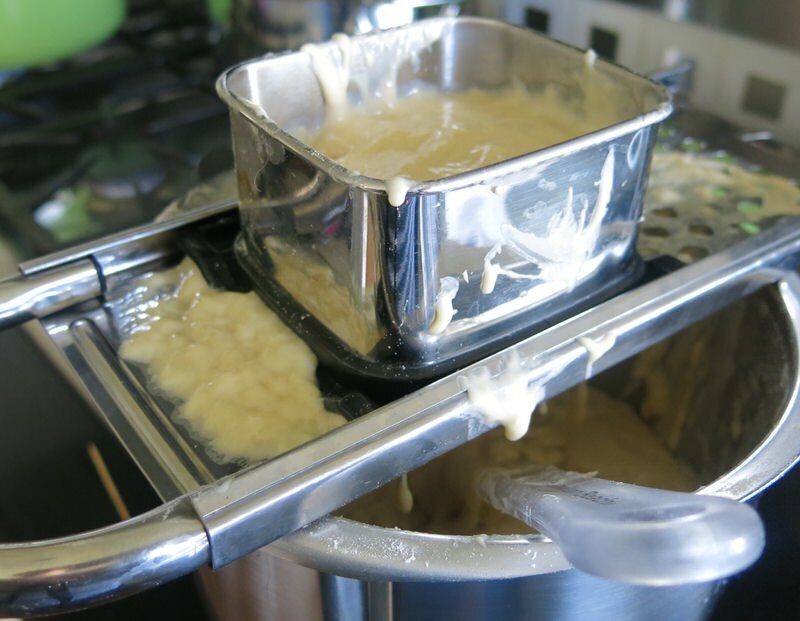 It is a pain and creates a huge mess as the dough gets pushed over the end of the maker with the box on top and spills all over the stove top. The box doesn’t fit tightly enough, either, and batter escapes all over the place. 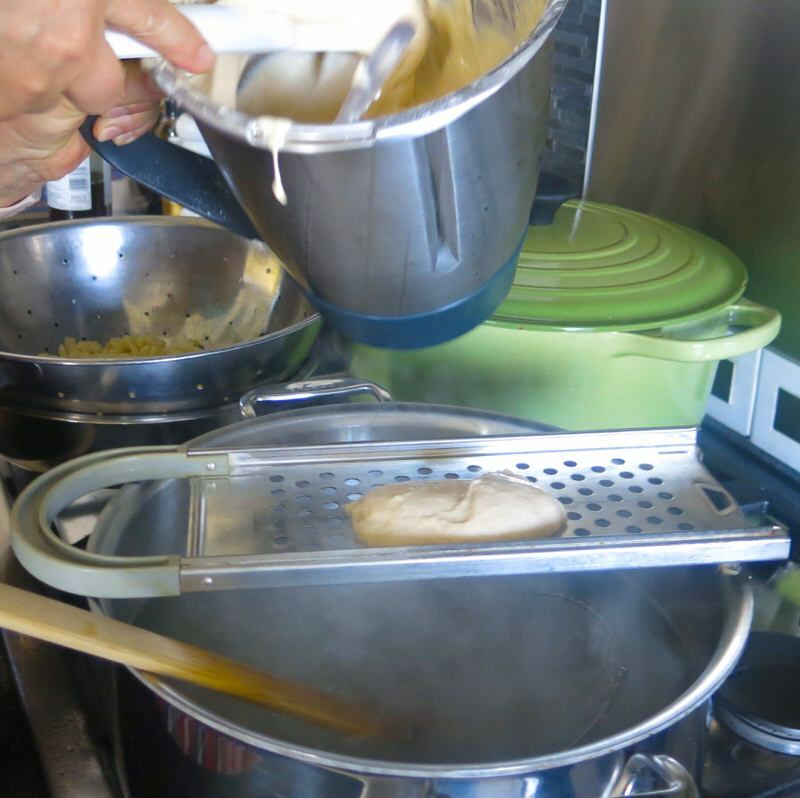 She plopped a dollop of the dough onto the middle of the maker, used a firm hard, unyielding spatula, and pushed the batter through the holes in the maker with a rigorous and rhythmic back and forth motion. It looked hard, til I tried it myself: easy, peasy! But, without her showing me, I would have never arrived at this solution. 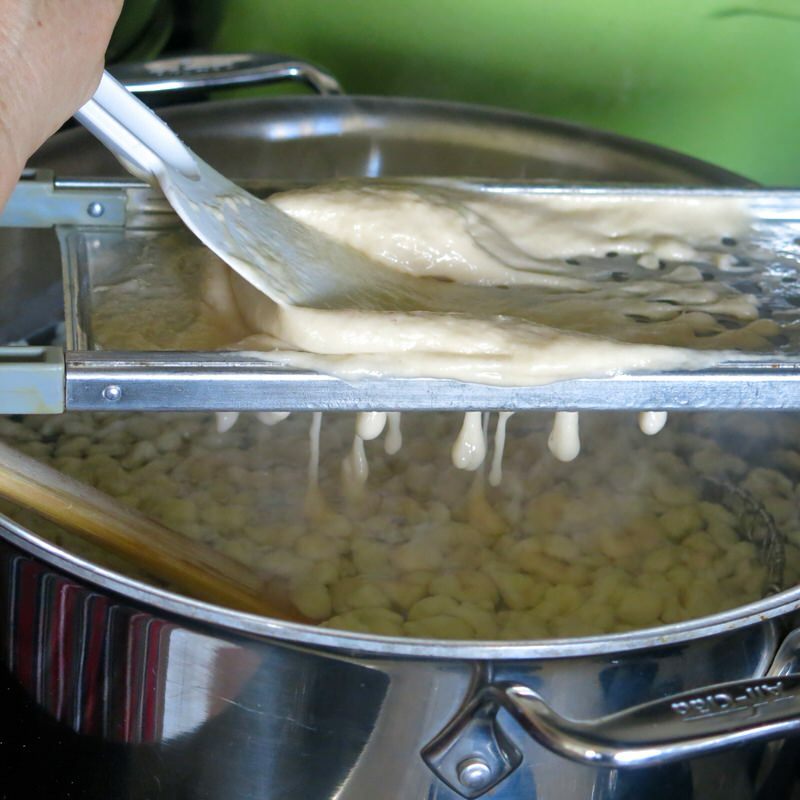 Above, the dough sits on the Spaetzle maker without slumping. 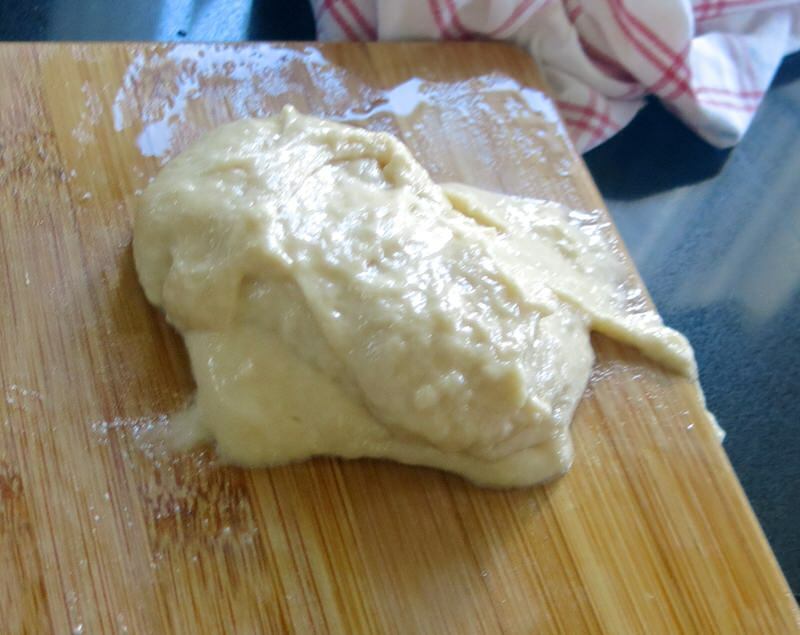 The consistency is perfect when the dough behaves like this. The little sparrows plop into the boiling water, below. 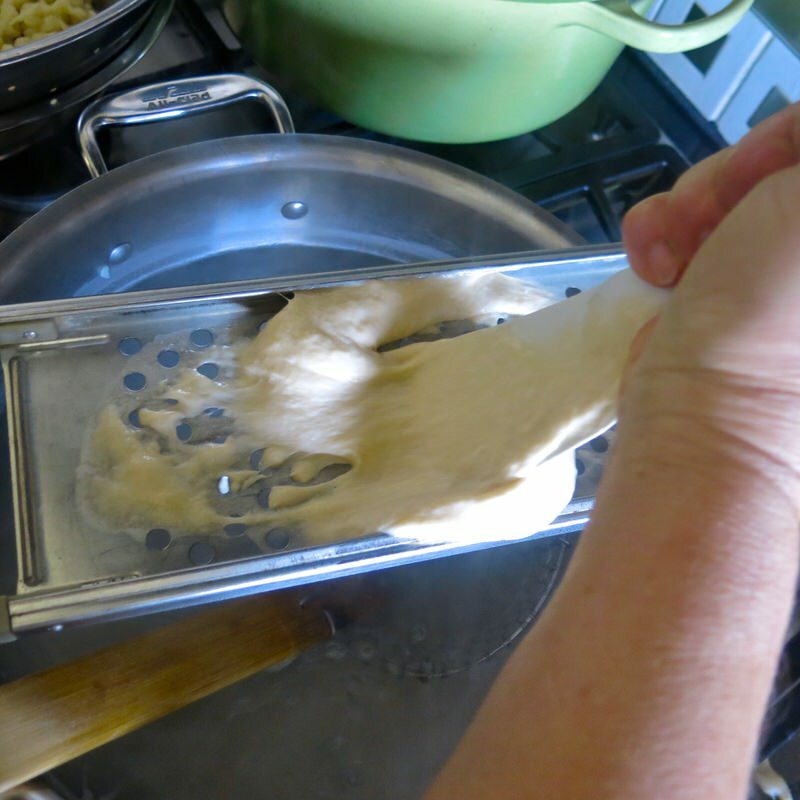 She pushed to guide the dough through the full width of the maker both directions. 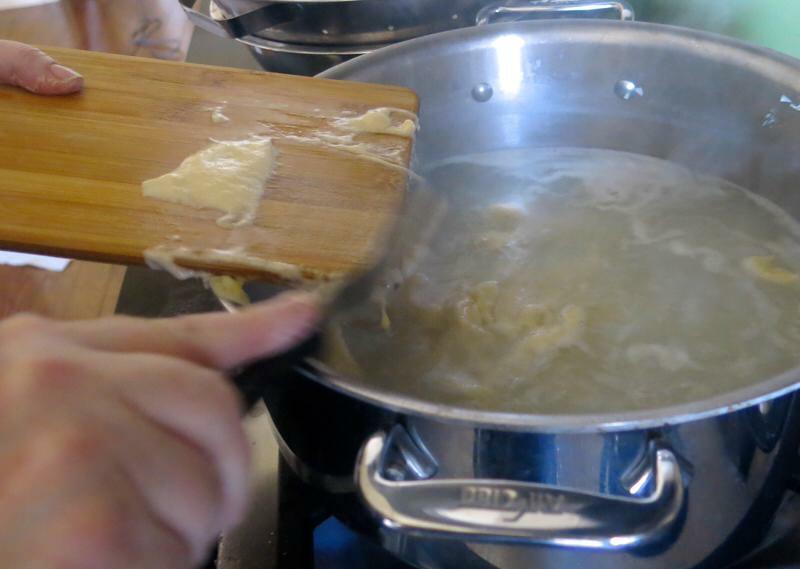 Once that amount was pushed through, we would do one more before straining the egg noodles from their water bath and buttering them in the colander. 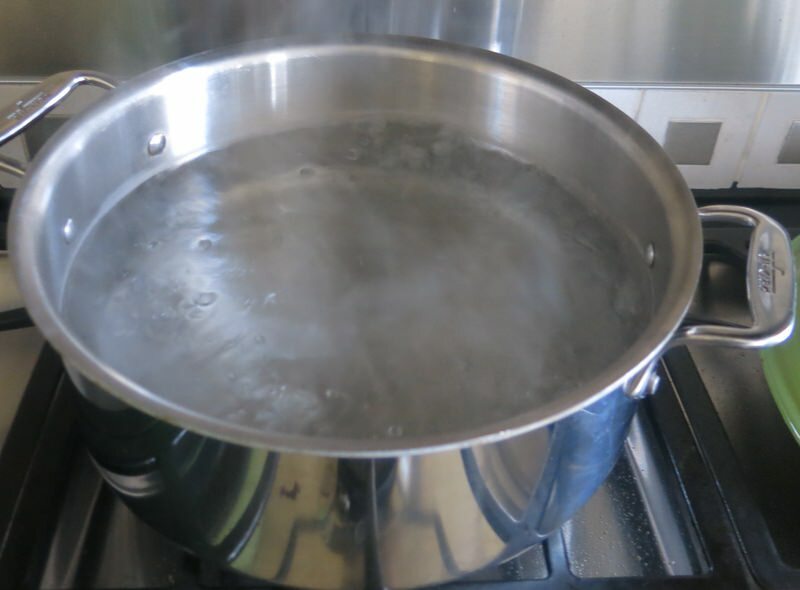 Let the water come back to a boil when finished with the dough. Ensure all have risen to the surface. 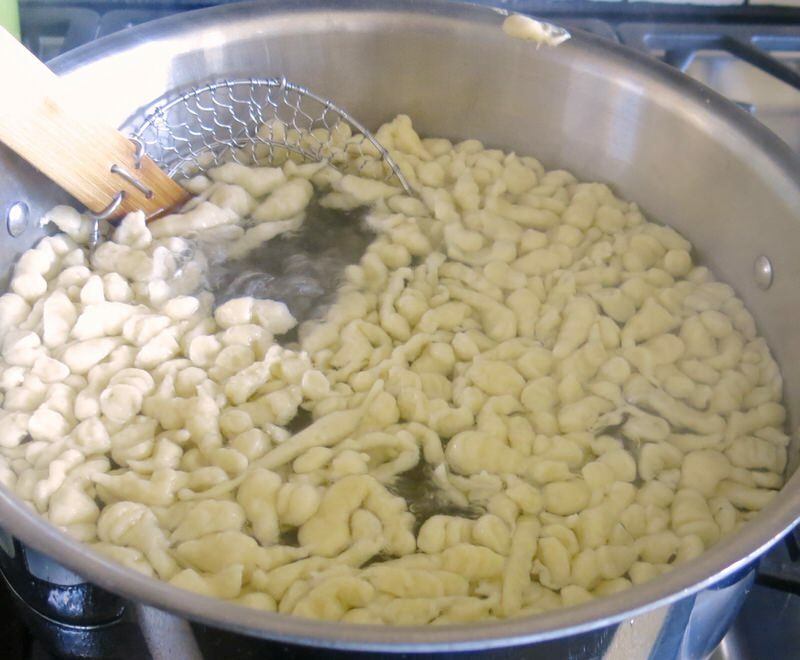 Once the last bit has been cooking for at least 1 minute, remove to the colander and add a pat of butter to ensure they don’t clump. Let them drain, and continue with the next bit. 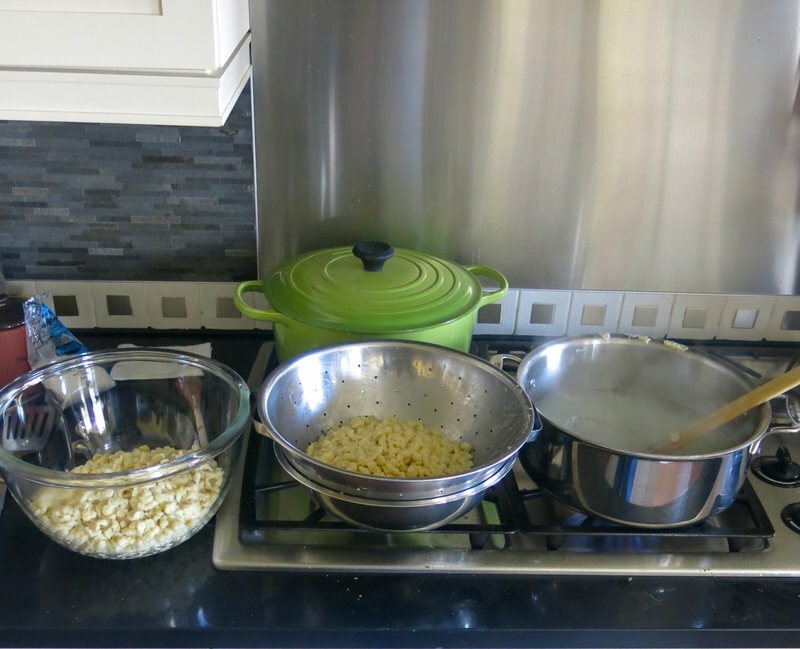 Once the next batch is complete, and you are letting the water bath come back to a boil for a minute, transfer the noodles from the colander into the bowl; continue to toss to avoid any clumping. 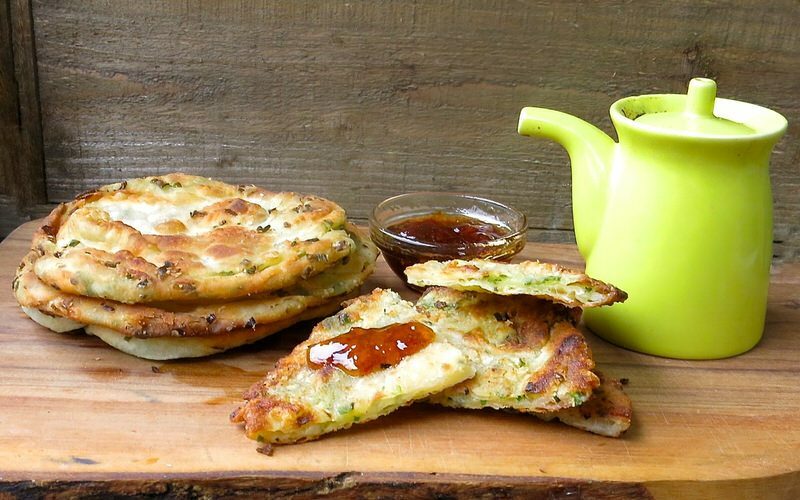 Repeat until all dough is coddled into plump little sparrows, all buttered and ready to serve! Before finishing, Margaret did demonstrate hand cutting. Of course, we did not. 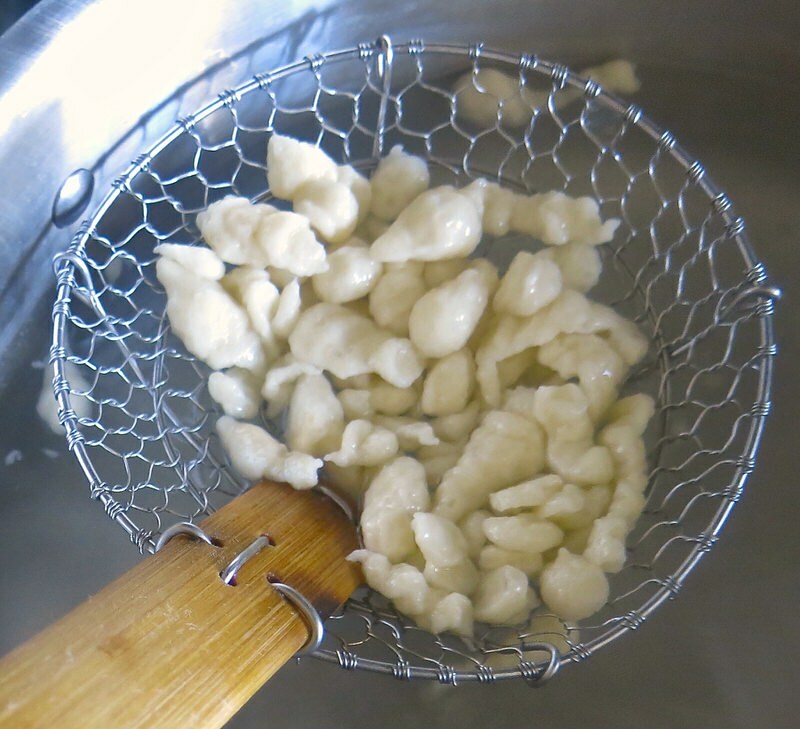 We got fat little tapers, nothing like the elegant shoots you will see in some images of hand cut Spaetzle. But, it was sure fun! Above, right, is the proper width. Look at our achievement. That is one mighty big bowl. But, I wouldn’t make less when I do it again. Why? They freeze beautifully and I really enjoy the flavour, the toothy mouth feel and the variety of ways they can be prepared. Lay them flat in a labeled and dated freezer bag and freeze until needed. Thaw and serve as you would freshly made. 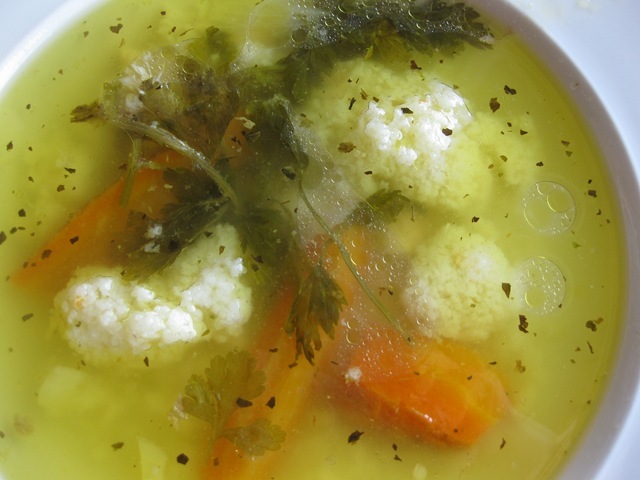 This recipe is an important side for the wonderful Bose Johnson traditional Christmas Eve dinner, above. 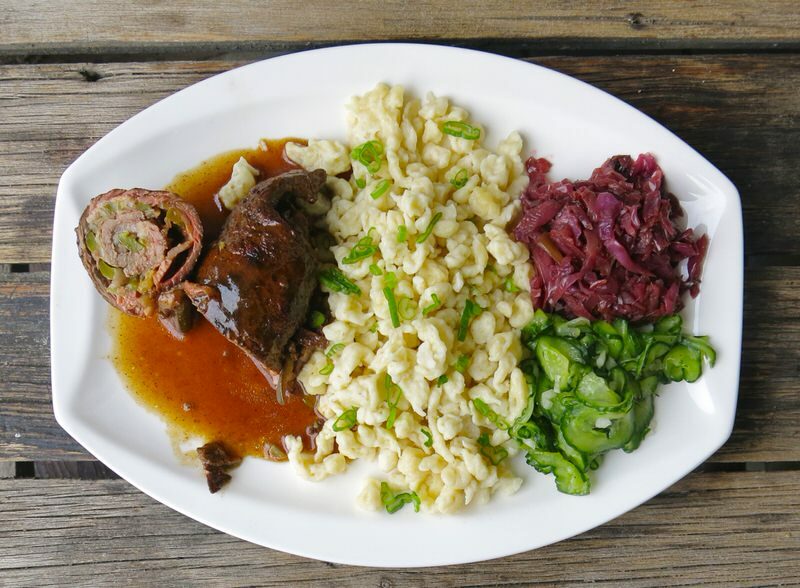 We made all four recipes together, and all are posted here: The German Fleisch Rouladen, the Braised Purple Cabbage and the Cucumber Salad. What an exceptional treat. 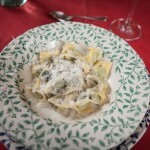 This was one memorable Sunday Supper! 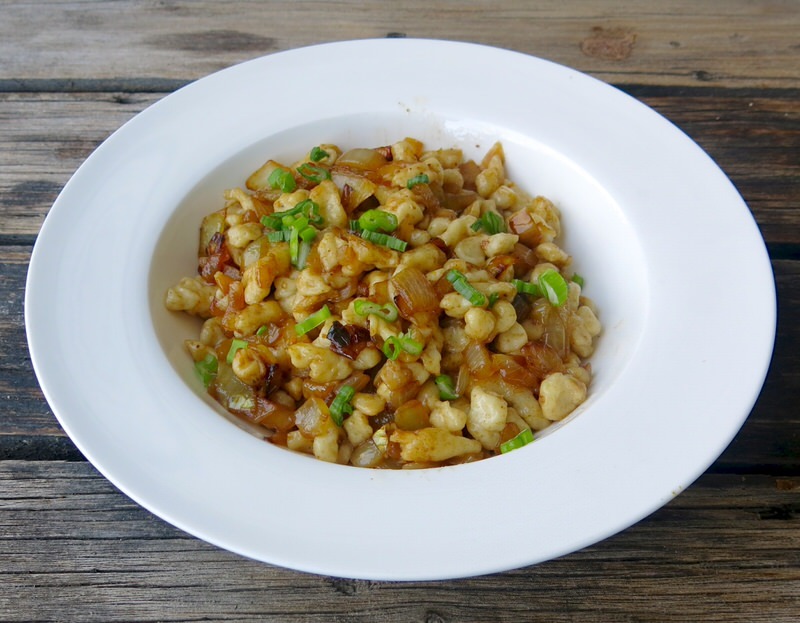 German Spaetzle or Spätzle (soft egg noodle): Brown Butter and Onion Spaetzle Hash Browns! 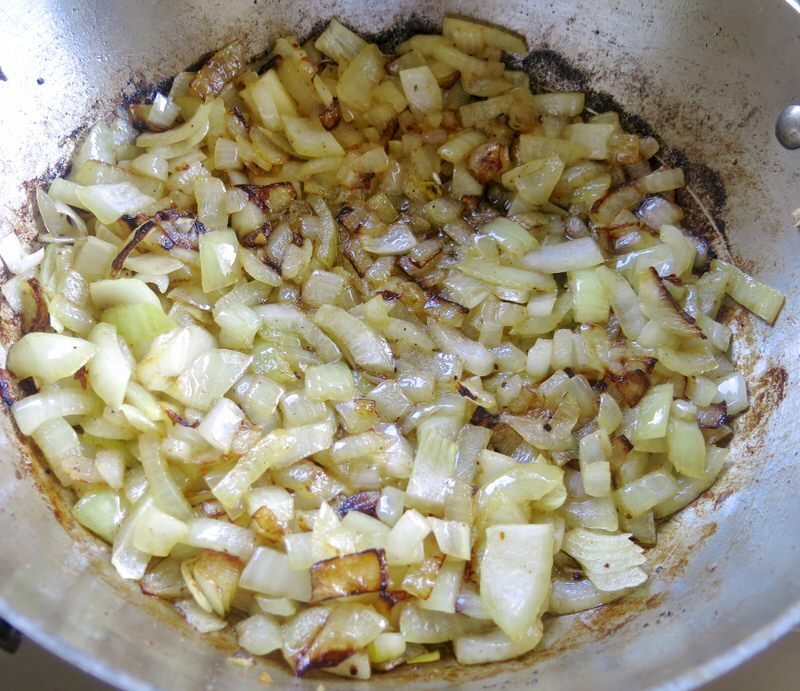 Brown butter and onions: sweat them and caramelize them. 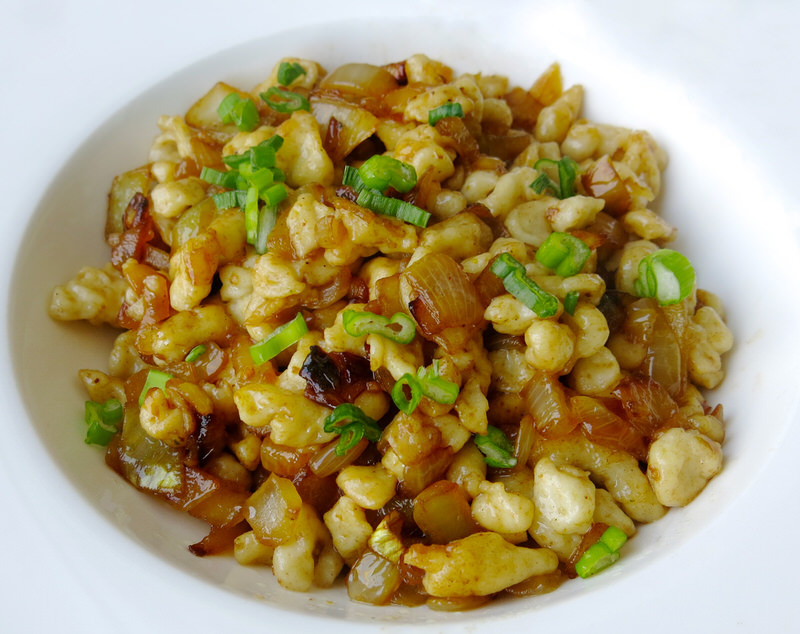 Serve with a garnish of crisply shaved tender green onions. Yes! Vanja loved it. I heard the gutteral groan from the back of his throat after his first bite. 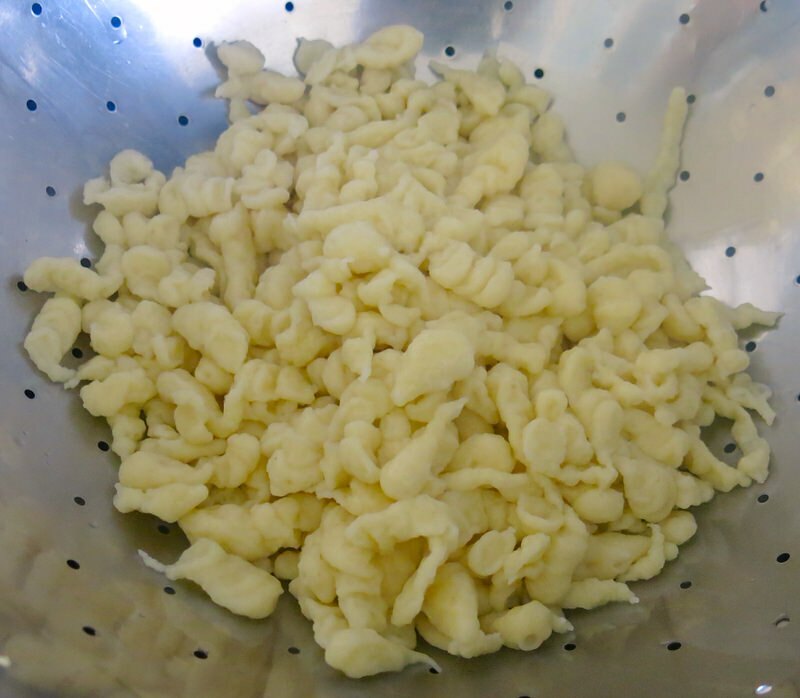 Oh, Spaetzle and I have a future ahead. Yes, we do! Thank you, Miss Margaret! 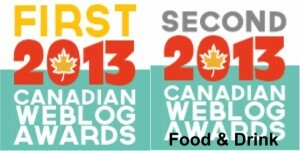 And, dear readers! Chime in! Do you make it? How? Favourite way? 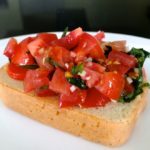 Favourite meal to serve it with? Inquiring minds want to know! Margaret’s Post about her experience here which includes information about how to prepare ahead for a crowd. 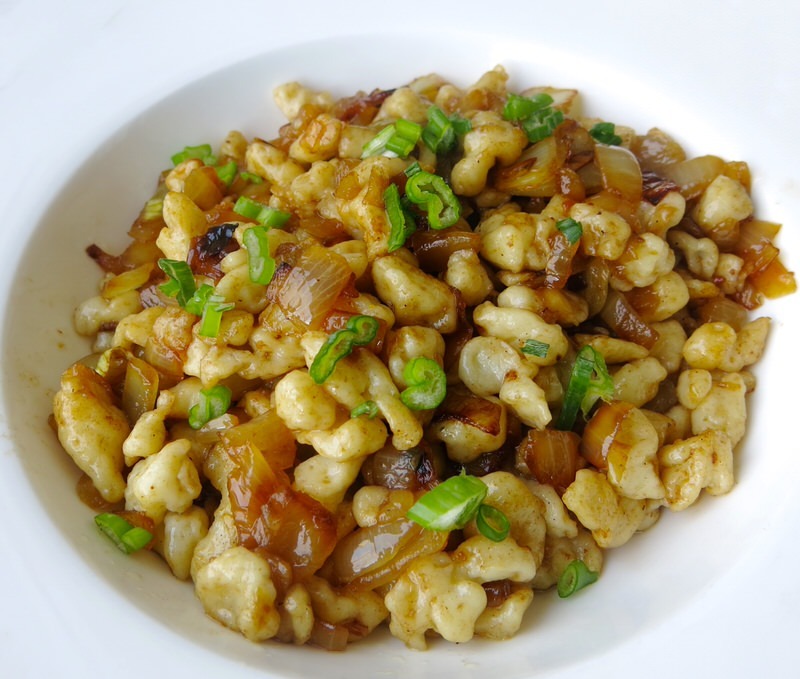 German Spaetzle or Spätzle in the Kitchen with Margaret Bose-Johnson. Step by step images. 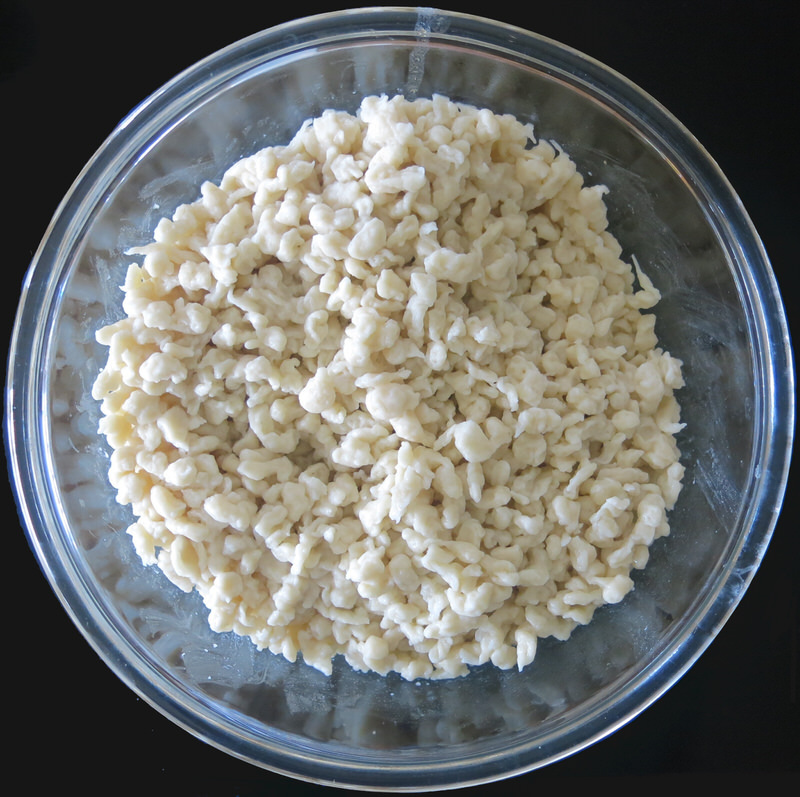 Specific Spätzle dough consistency information and instructions. 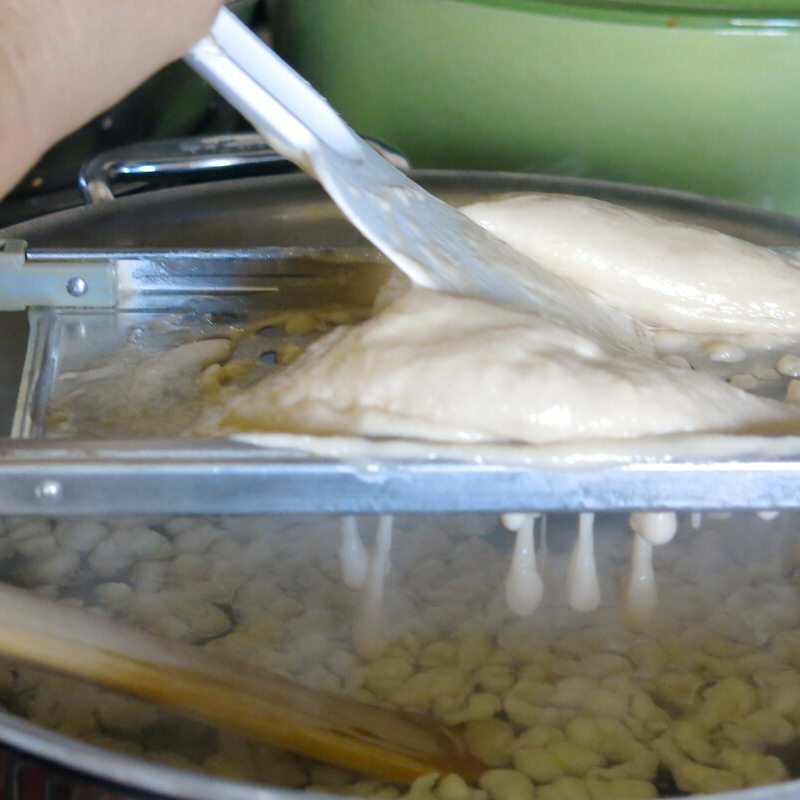 Dough will bubble as air pockets form within it; it will be very stretchy and elastic, and will stay in place when plopped on a working surface. You have the correct consistency when the dough holds its own. It is shiny and sheets when pulled. 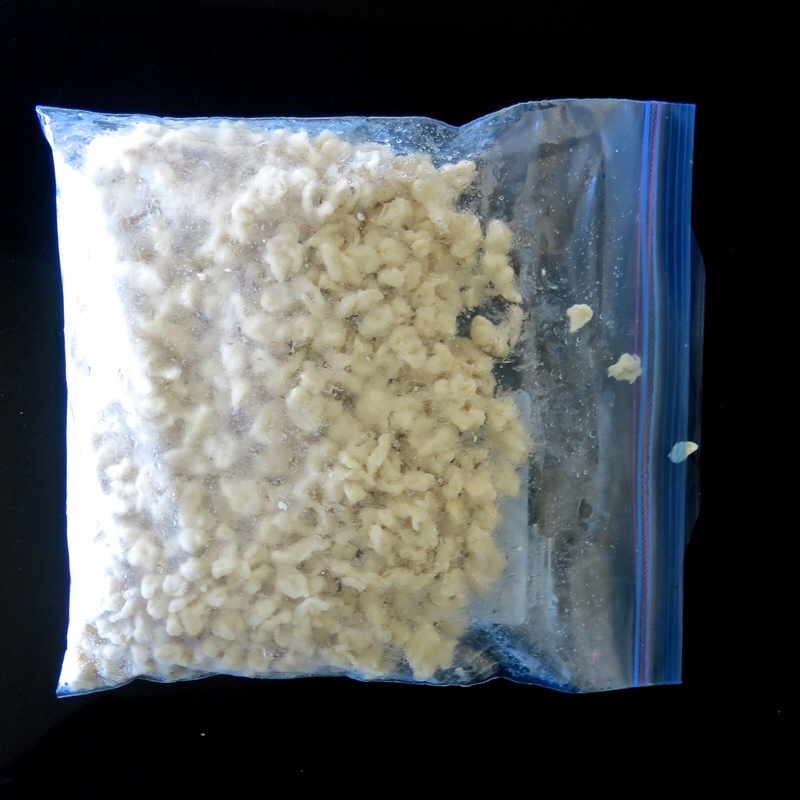 It is elastic and will stay and a blob when placed on a small board. The dough will not “run” or slide. 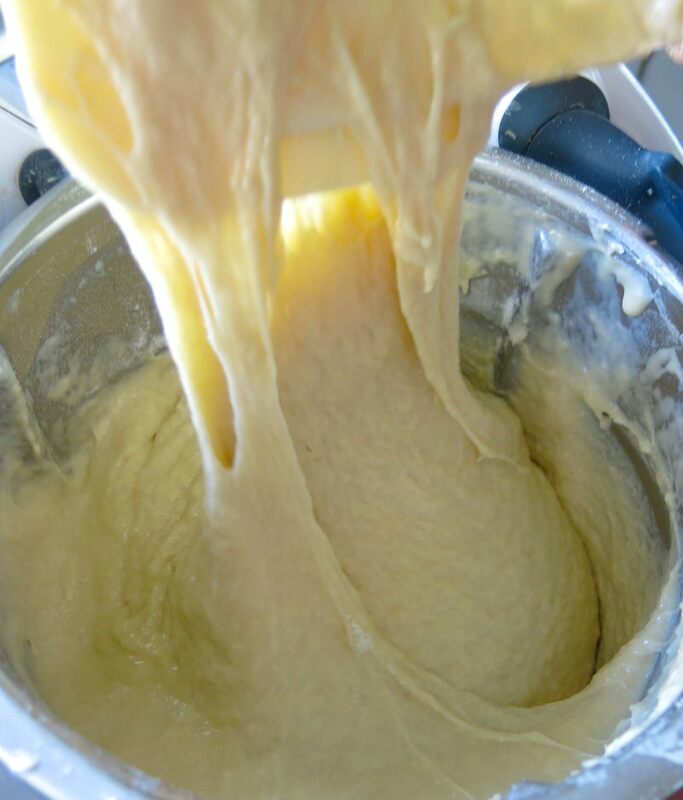 It is more dough-like than batter-like when the correct consistency has been reached. We made 4 batches or put 8 large portions of dough on the maker with this recipe. Valerie, I LOVE your writing, and your description of the ‘little sparrows’ plopping into the dough made me laugh! 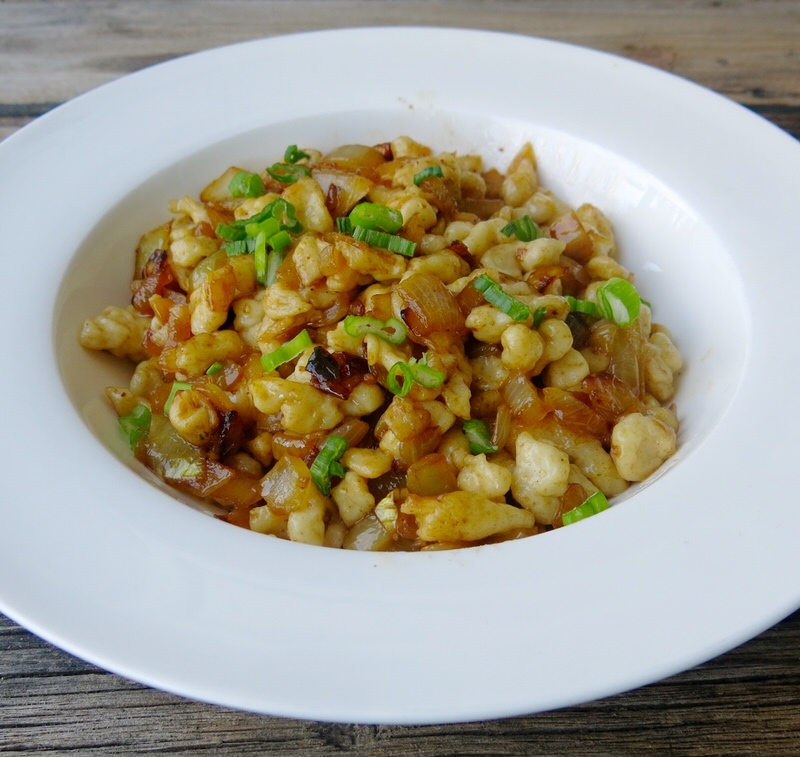 You have taught ME a thing or two about Spätzle – I have never heard of them being served as a sweet dish with apples or cherries (though now that I think of it, my mom often filled perogies with fruit fillings and we ate them as a meal – this would be a similar idea). 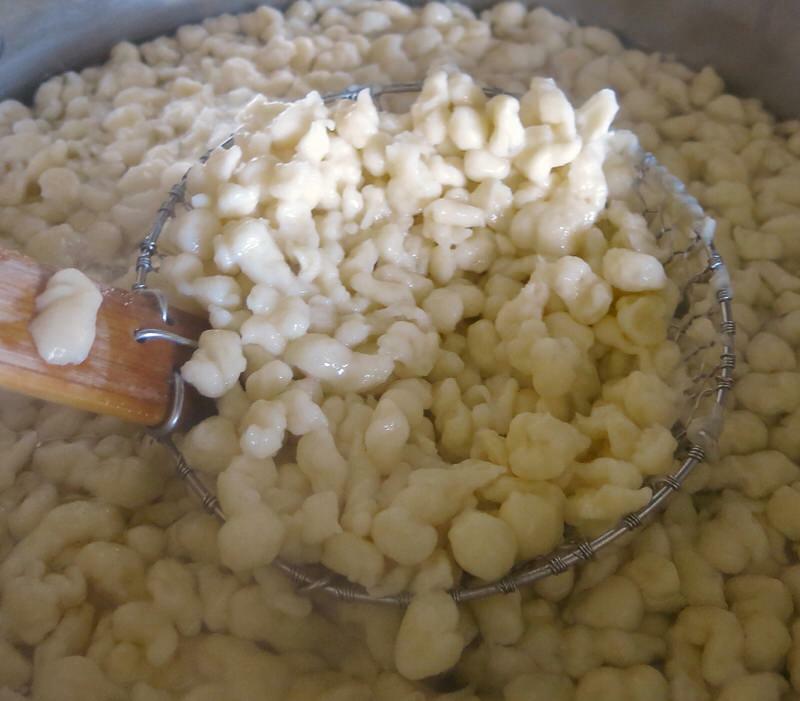 I can’t wait to try the Spätzle now as a sweet dish – I know my family will love it. 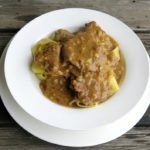 Your description of the dough/batter is right on and should be a great help for anyone attempting this versatile German noodle for the first time. It was a lot of fun making these with you. 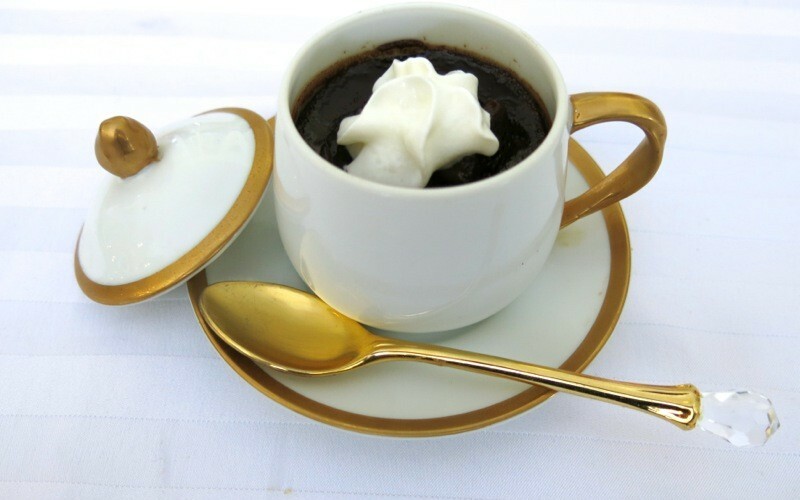 With Vanja also coming from Eastern Europe, and all the traveling we have done there, Margaret, I wasn’t surprised, either, to discover they are served sweet in some specific regions of Germany. Both versions come from the same region and both sound delicious. Grating the apples into the dough fascinated me. There isn’t anything a loving mama in her kitchen can’t concoct when she’s trying to feed a hungry family with only a few simple ingredients. Learning how to make this without that little annoying box on top of the maker was transformative for me. I used to think like that all by myself. What has happened to me? Oh, don’t tell me. I know. WOWOWOW! sounds delish! Thanks for sharing!